Temporal arteritis is an inflammatory disease of the blood vessels. The most common vessel involved is the superficial temporal artery on the side of the head. The disease starts after about age 50 and affects women much more than men. The most common symptom of temporal arteritis is headache. The headache is usually located on the temples. It is mild to moderate in intensity, aching and continuous in nature. Occasionally, the patient may also complain that his scalp feels sore to touch. 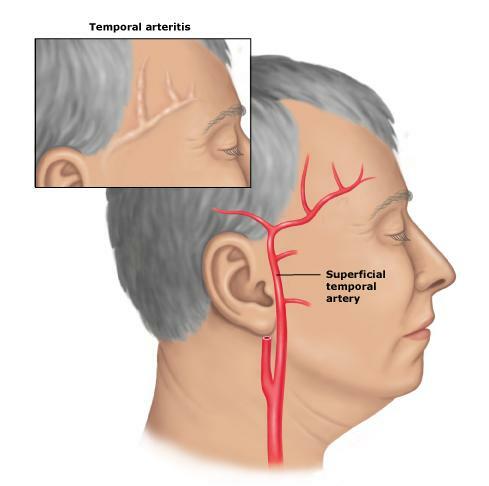 One of the cardinal signs of temporal arteritis is pain while chewing food or jaw claudication. Muscle aches, pain and stiffness in the shoulder are common and may be associated with Polymyalgia Rheumatica. Approximately 50% of patients with temporal arteritis have polymyalgia rheumatica. On physical exam, the scalp may be tender to to touch and the temporal artery may be swollen. A blood test called the erythrocyte sedimentation rate or ESR will be elevated in most patients. Another similar test is the C-Reactive Protein which also follows indicators of inflammation in the blood. The definitive diagnosis of temporal arteritis comes from a biopsy of the temporal artery. That biopsy is examined under the microscope for evidence of the disease. Complications from temporal arteritis include blindness due to loss of blood flow to the optic nerve, aneurysm of the blood vessels and stroke. It is because of these complications that treatment is started immediately once the diagnosis is suspected. MRI scans are useful to look for evidence of intracranial disease such as aneurysms. The treatment of temporal arteritis is corticosteroids. This treatment will need to be continued for one to two years. Since there are many side effects from corticosteroids, your doctor will need to monitor your treatment closely. Once the signs and symptoms of the disease have abated, the medication may be slowly tapered off.